Part of being a good steward of our roads is developing a holistic approach in maintaining them. An approach that treats the right road, at the right time, with the right treatment and the right way so that our roads will perform as expected. Looks matter so we want the treatment to have the right look too. Another part of that approach is to factor in the impacts our treatments will have on the environment. The focus of the discussion here is our Department’s approach in being more “green” or sustainable in our treatment selections. Traditional approaches of surface treatments focus on removing and transporting distressed portions of the road surface to landfills and then resurfacing these roads with imported hot paving material. This approach was and still is the way many agencies maintain their roads. Over the years, in collaboration with the paving industry, agencies started developing and implementing green or sustainable approaches in maintaining their roads. The reason for this switch was not only for the environmental benefits but also because sustainable treatments are cost effective. Although our Department is at the initial stages of utilizing these treatments we are very excited about moving forward and implementing these treatments wherever it makes sense. To some this approach might sound misguided. Why would you use scarce resources to fix good roads while the bad roads are the ones that need the repair the most? Many people understand the long term benefits of performing preventative maintenance activities on their homes and automobiles. Painting your house every 10 years or changing the oil in your car every 3,000 miles are activities that preserve the value and improve the performance of these assets. These regularly scheduled preventative maintenance costs are generally far less than the ultimate repair cost and go a long way to keeping the assets in tip-top shape. Because the treatment costs to preserve the good roads is substantially less it enables the County to preserve between 4 to 10 times more streets than if we focused on the bad roads. This practice of keeping the good roads in good condition is an industry-wide practice called “pavement preservation”. Why is taking care of our good roads first green/sustainable? One component of being green/sustainable is to use less energy to perform the specific treatment. Pavement preservation treatments are treatments that are applied directly to the pavement surface and use materials (emulsions - temperature 100-150 degrees) that use far less energy than repairs for the heavily distressed roads. For roads that are in poor condition, generally, the top layer(s) of the road are removed and hauled to a landfill and require hot paving material (temperature 275-300 degrees) to repair the road. The energy utilized in the operations of removing and hauling the distressed pavement to a landfill, importing new pavement and heating the pavement to a higher temperature all add up to a much larger energy use and greenhouse gas impact than pavement preservation treatments. In fact, a study performed by the National Center for Pavement Preservation determined that pavement preservation treatments resulted in up to an 80% reduction in energy usage and greenhouse gas emissions as compared to hot mix treatments. Another green/sustainable approach is to utilize materials that typically would go to the landfill as part of the pavement mix. The Department has been a long time recycle of incorporating automobile tires into our pavements. For each lane mile of roadway that incorporates tire particles into the asphalt hot mix 2000 tires are eliminated from going into the landfill. Not only does this approach help reduce the amount of tires going into landfills the addition of tire particles into our pavement mix has resulted in significantly improving the performance of our roads. Our Department performed a study that evaluated the performance of “rubber roads” and learned that adding tire particles to our pavement mix resulted in (a) significant reduction in pavement cracking (b) roads lasted 40 to 60 percent longer than conventional asphalt (c) less pavement noise than other pavements treatments and (d) less fading of the roadway surface. Our Department is now looking at the opportunity of recycling asphalt millings called Reclaimed Asphalt Pavement (RAP) into our pavement treatments. In fact, in 2012 our Department committed to using 100 percent RAP for all pavement preservation projects in the North County. This process will enable us to recycle these millings into our treatments rather than hauling them to a landfill. Of all the pavement treatments, roads that require major reconstruction are pavement treatments that impact the environment the most. Typically, these projects include removing the existing asphalt and at times the layers of material below the pavement. Trucks then haul the material away from the project site generally to a land fill. Virgin pavement material is then imported to replace what was removed. As you can see, significant energy is needed to transport the material in both directions from the project location and raw materials are needed to construct the road. Processes are now available that refurbish roads in-place by reutilizing the existing road materials resulting in significant environmental benefits. Reusing what is in place eliminates the energy required to transport old and new material from and to the construction site. By reusing the existing materials we also avoid removing raw materials from the earth. Eliminating the truck traffic on the project also helps reduce the impact to motorists and greatly expedites the project completion. Reutilizing the existing materials in-place is an approach that not only reduces the environmental impacts and public inconvenience on a project it also has the added benefit of saving significant project costs. Measuring the results of our Department's sustainable program is a critical component in determining success. In 2010, the National Center for Pavement Preservation and Crafco Inc. prepared a document that quantified the energy use and Greenhouse Gas Emissions (GHG) for various pavement treatments. This report provided data for multiple sustainable and hot mix treatment alternatives and included energy and GHG data for each step of the process. These steps include obtaining raw materials from the earth, transporting, refining, manufacturing, mixing and placement of the materials. The energy usage and GHG emissions net savings for our program was calculated by using the data in this report and comparing each sustainable treatment used by our Department with the equivalent hot mix alternative. 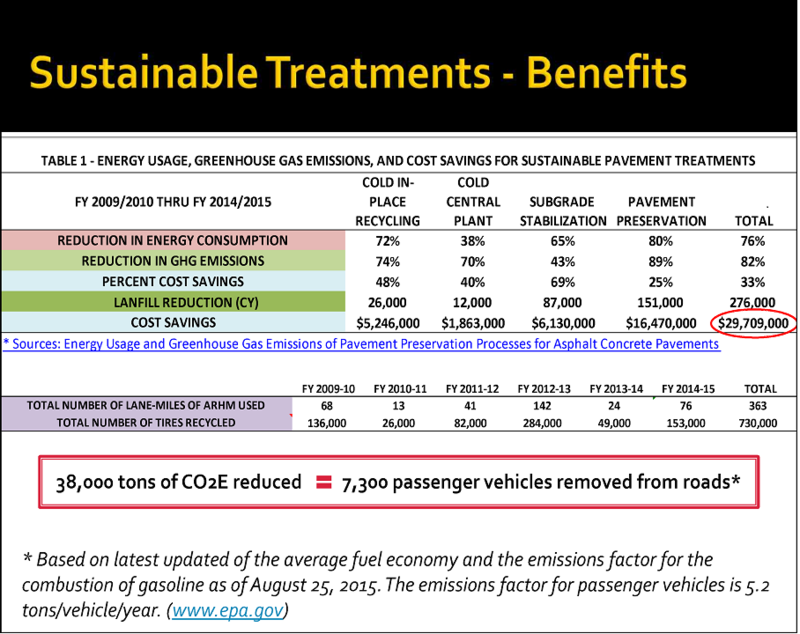 The following table shows a summary of the reduction in energy consumption, GHG, landfill reduction, and costs achieved since 2009 under the Department's sustainable treatment program for County roads.